Are you searching for a right handed shoe that has comfort and utility? This Dexter Women's Deanna could be just right for you then with its black/grey/pink color. Take these stylish shoes to your alley and bowl in comfort. Stylish looking and feel great on. Though these fit perfectly the so called "leather" is not perfect. First the shoe on the right is peeling. Next the right sole is almost flapping. I would understand if I were in several leagues but I'm only in one and I practice once a week. I've had them for under a year. For the expense these are not worth it. 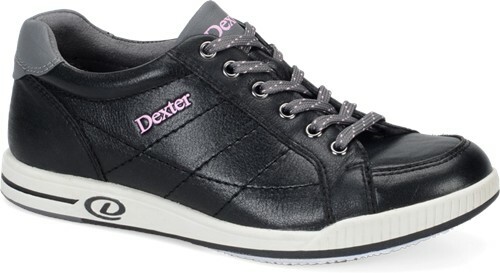 Is the Dexter Womens "Deanna" bowling shoe made out of leather? Hello Z! Yes it is made out of leather. Is the shoe a true fit? Hey Ophelia! According to customer reviews, these shoes are true to size. Are the soles interchangeable on the slide foot? What slide comes on the shoe? Unfortunately, these do not have an interchangeable sole on the slide foot and it will come with a long slide sole. Due to the time it takes to produce the Dexter Womens Deanna Right Hand ball it will ship in 2 bus. days. We cannot ship this ball outside the United States.